Fly your favorite flutterer within gazing distance of the famous volcanic plug. If this is spring to you, and the Central Coast burg is a must-see favorite, two of your loves will weave together near the end of April 2018. WHERE DOES A KITE ENTHUSIAST... find "... some of the best kite-flying wind in the world," and a place that is notably beautiful, too? The Central Coast has that second bit wrapped up, all year long, and Morro Bay is no stranger to the sweet breezes of springtime sweeping in with hair-twirling, shirt-fluttering panache. This must mean it is a primo spot to send a kite into the sky, and so it is, and so several people do when spring has settled into its groove and the days have warmed and brightened. We are moving in the direction of late April here, that warm and bright and spring-grooving time of year, and we are gazing upon Morro Rock, which is in the background, grandly, of much of the kite-flying action. 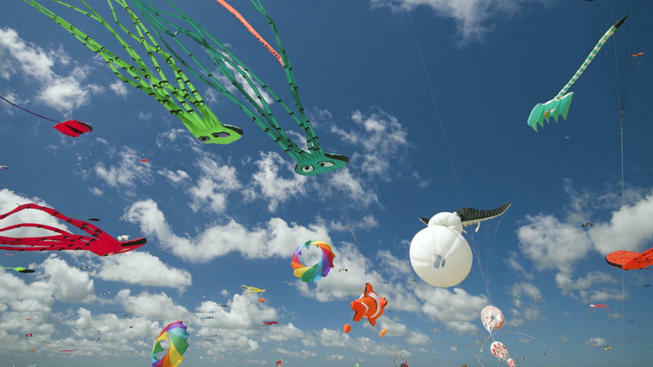 So wait for it: The Morro Bay Kite Festival, a completely free gathering of the most ethereal, wind-dancing-iest kind, is back at the ocean-close burg on Saturday, April 28 and Sunday, April 29, 2018. THERE ARE SEVERAL ELEMENTS... to the schedule, from a kite fighting display (that actually opens early, on Friday the 27th) to demos focused on the art of kite surfing to a candy drop. There's an after-party, too, on Saturday evening at Giovanni's Fish Market, but "after" shouldn't imply it is a late-nighter. It runs from 4 to 6 p.m., giving kite mavens enough time to tuck into bed so they can be back on the sand, flying their kites on Sunday. As for the sand surfing demo? Visitors are invited to "try it for free!" Oh yeah. If this is the spring you vowed to get out with your silk-and-bamboo sky-rider, then fold pretty Morro Bay, and its annual up-above-it-all party, into your plans.